What is an elder’s responsibility? How are elders chosen and trained? How can a leader and a team work in unity? How does a team deal with discipline issues in the church? How do you resolve eldership team conflicts? Find answers for these questions and more! Discover how every member of the body of Christ is affected and empowered for ministry when elders give healthy oversight to the church. This biblical model communicates the family character of the church as teams of servant-leaders equip, protect and love the local church. Complete with evaluation questionnaires, sabbatical guidelines, sample church by-laws, keys to developing a vision statement, biblical steps to make godly decisions, maintaining a leader’s health, and much more. Audio set and DVD training available! 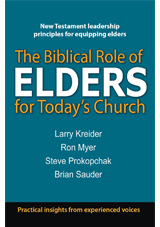 About the Authors Steve Prokopchak, Ron Myer, Larry Kreider and Brian Sauder, featured speakers at conferences and churches worldwide, serve on an apostolic team that oversees DOVE International®. DOVE is a family of churches throughout the world with each congregation having its own team of elders. This book comes from years of serving in church leadership and training leaders within many denominations throughout the body of Christ.